We are teaching children not to judge people for being different or strange. We are learning that there are no monsters “out there” other than misguided fear of the unexplained, paranoia, xenophobia. But there’s a border we have yet to cross, though we’ve been dancing around it. In these post-modern reconciliations between good and evil, tearing down traditional dichotomies and value hierarchies, we are quite literally encroaching on sacred ground. Where does God and the Devil stand in our contemporary story-telling? If there is no real evil, and no righteous justice against the monsters of the night (whom we can in good conscience slaughter) what does that mean for the blinding presumptions of organized religion? The question is so much more fascinating as a student of Paradise Lost – the first and earliest retelling of the battle between good and evil, which blurs the lines of sympathy by making Satan into an epic hero full of grand speeches. Paradise Lost almost single-handedly created the archetype and model that’s been used for Captain Ahab; Manfred; the Faust Legend; Pirates and Revolutionaries; Guy Fawkes – that is, the lone hero standing up for freedom, for the good of all, against a tyrannous political force. And even though this is certain, and a long line of direct influence can be traced from Milton’s Satan to all our contemporary heroes, our society still resists acknowledging this issue. Satan can’t actually be a hero. We aren’t ready to accept that. That’s why the Paradise Lost movie, which keeps beginning then halting production – the last time it was going to star Bradley Cooper in 2012 – can’t actually get made. But instead we can have Batman, The Dark Knight – who uses darkness to fight darkness. And now Dracula, quite literally, Son of the Devil. 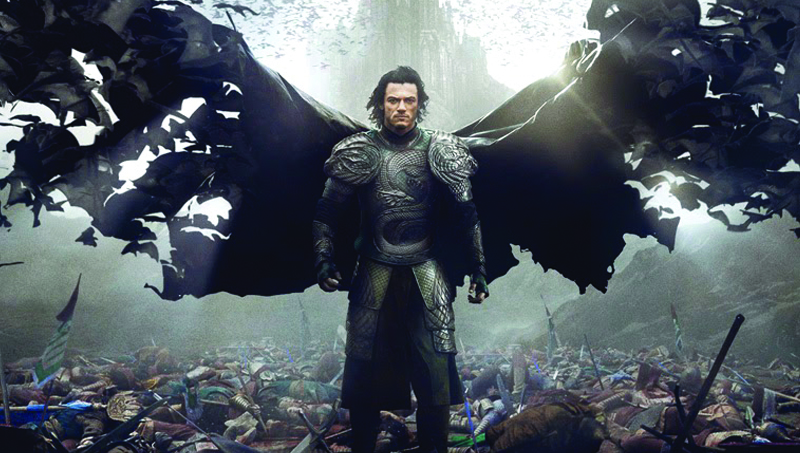 (Vlad’s father was called “Dracul” – dragon, or devil – and Dracula just means “son of”). In the movie, Dracula makes a bargain with the devil (or sorts) for the power to protect his family. He gives up his soul for supernatural abilities to save his people. He is a sacrificial savior. Whereas most previous Faustian legends warn us against making deals with the devil, because the devil will always lie and cheat, in this movie Vlad seems to get exactly what he wanted – he becomes powerful and he does defeat his enemies (even if, also alienating everybody he loves). Sometimes the world doesn’t need another hero. Sometimes it needs a monster. I love that film, primarily because of what you’ve written here. I think it’s amazing how character archetypes are being re-evaluated and people get to see the different sides of good and evil, and the greys of black and white. And I honestly envy you for being in Romania! Can you spend a night at Castle Dracula? That would just be awesome haha.